Summary: If you build engines for a living, Dynomation-5 is an essential tool that will help you keep your competitive edge! Dynomation-5 lets you peer inside a running engine! It reveals–otherwise invisible–pressure waves and mass flow in cylinders and engine passages. Dynomation-5 will accurately display how much power an engine will produce, but it will also show you why it makes that power and where you should put your efforts to optimize performance! 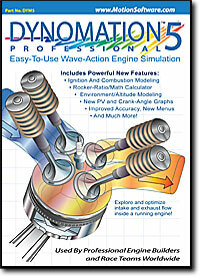 Latest Version-5 adds combustion and ignition modeling, environmental modeling, improved integration between the FE and WA models, improved camshaft and rocker-arm modeling, improved tables and charts, new Pressure-Volume and Pressure-Crank-Angle graphs, Crank-Degree data tables, comprehensive support for metric and US measurement systems, and much more!